Dawnbreaker Farms: Support us with edible credits. 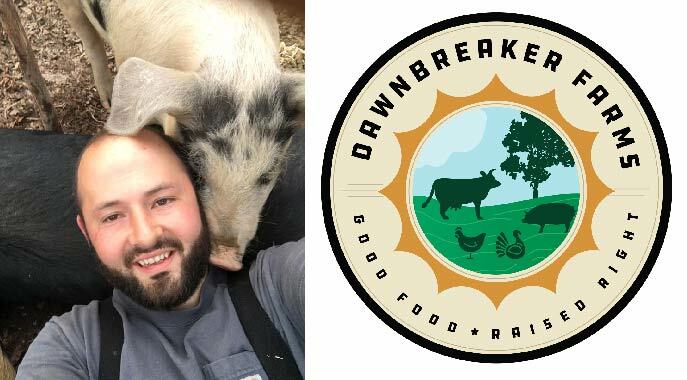 Dawnbreaker Farms raises pasture-raised and GMO Free chicken, pork, turkey and grassfed lamb. We use natural systems that mimic nature for the soil's health. Our nutrient dense meats can be found across the Triangle at farmer's markets, our monthly delivery programs and select restaurants and grocery stores. As an urban kid from environmentally conscious Seattle I have always been drawn to environmental causes. I religiously recycled, took public transportation and reduced my consumption of consumer goods. Somehow that lifestyle never translated into the food I was eating until I came across Michael Pollan's "The Omnivore's Dilemma". That book opened my eyes to the environmentally disastrous food system that I was wholeheartedly participating in. I had no idea my food choices were leading to systematic exploitation and degradation of the same earth that I worked so hard to preserve. Overnight I began seeking out alternatives of how to create a more sustainable food system. After many years that path led me to start Dawnbreaker Farms which has the three pronged mission to regenerate the ecosystem with livestock, generate a profit and livelihood for the farmer and teach others to do the same. This commitment runs deep in everything that we do from the management of the animals, to the grazing patterns we employ and the way we treat farm guests and employees. We ambitiously strive to use this farm as the practical launching pad for the regeneration of our land, economy and our culture. By pre-paying in advance you can help us to increase production thereby supporting our mission to better manage our land regeneratively and provide a livelihood for the farmer family and our employees. A strong commitment at $1000 gives you an extra true farm to table experience: a guided tour plus a dinner at the farm using farm raised product from our farm and other local farms!